According to Benjamin Franklin, early to bed and early to rise was supposed to make us healthy, wealthy and wise. And Ben Franklin was right. He understood the importance of proper rest and being industrious and productive during our daylight hours. There’s no arguing that a good night’s sleep makes you feel like you can take on the world. Having enough sleep will make you less prone to disease, more effective in your job, a more pleasant person to be around and in feng shui, more likely to have romance — and wealth. 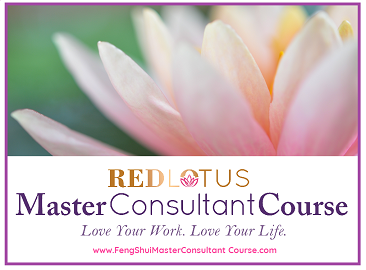 Besides the front door, the second most critical area in feng shui is the bedroom. For the foundation of good health, the bedroom that’s arranged well and optimally for sleep is also the bedroom that is also arranged best for romance and has relationship enhancing qualities. Perhaps equally important, a bedroom that’s arranged well preserves wealth. A bedroom that isn’t often sees the occupants’ fortunes drained away, and their health and relationship often declines. The bed is a critical feng shui consideration because this is where we rest and regenerate for the next day. It’s also where we are the most vulnerable. When we sleep we are helpless and defenseless, and if there are negative energies around us, we are more prone to those negative energies. But when we are comfortable and supported, we rest fully and are more effective and productive in our daytime lives. Below are more tips about beds and bedrooms that all have good feng shui and will help you sleep better at night and be ready to tackle the day! Tip No. 1: Place the bed properly in relationship to the door. The first and most important step in bedroom feng shui is orienting the bed properly in relationship to the door. Look at the bedrooms below. These beds show typical types of placement, but each has a different impact on the sleeper. Below is an analysis of the impacts on each sleeper. Bed 1. This has the optimal feng shui placement. Although the bed is on the opposite wall from the door, the bed itself is not in line with the door. Another good placement would be on the wall diagonal to the door, placed in the middle. You can also place the bed on the far left wall and observe great feng shui, too. This is called the “command” position and is the most auspicious, makes you feel the most supported and comfortable when sleeping. Bed 2. This bed has the “death placement.” The bed is opposite the door and is in line with the door. This is dangerous — especially if this is a bathroom. 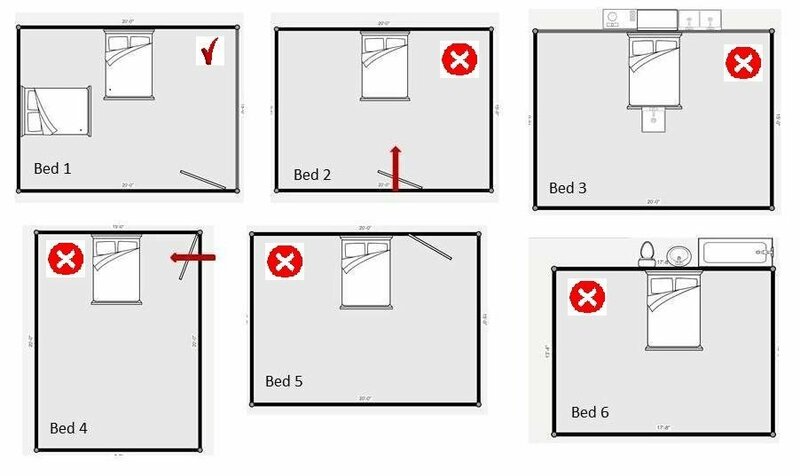 Many people with haunting disturbances have a bed placement like this and Bed 4 and Bed 5 and can develop serious illnesses and afflictions in the center of the body. The bed in this room should be placed in the middle of the wall on the left of the door. Bed 3 and Bed 6. Both of these beds are quite dangerous for health and wealth. The major concern with a bed and a bath or kitchen on the other side of the wall is that the bed does not share the same wall as a sink, stove, toilet or bath. 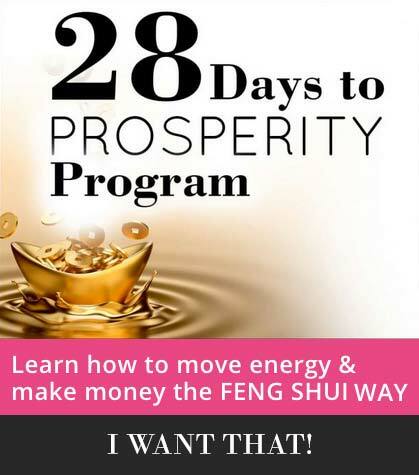 This can cause a drain of energy, vitality, and wealth. Bed 4. This bed has too much energy coming at it from the door. The bed should be place on the wall opposite for the best placement. Nerves, anger, and problems with the abdomen are likely with the door situated here. Bed 5. This type of bed arrangement causes surprises from behind. Whether relationship problems, financial difficulties or coping with one kind of crisis after another, having the bed on the same wall as the door will create an endless string of problems and bad luck. Tip No. 2. Make the bed support the sleeper and the relationship. Beds should support the sleeper(s) and should be comfortable. While beautiful, overly ornate beds may not be good support. Certain bookshelf beds and metal beds can cause headaches and troubles with the head. It’s best not to have metal headboards or metal night stands too close to the head. Beds should also be placed in the center of the wall and not against one side of the room or into a corner, which is often interpreted as a defensive position. Beds that are in the center or the room or placed beneath a window give little support and should be avoided. Tip No. 3. Can the bed make you rich? It could if your head is pointed in your personal wealth direction according to your kua number. However, it’s best to forget about your personal feng shui directions until you have placed the bed correctly. The rule is always to place the bed properly first and then observe personal feng shui. If you can position the bed on the two walls opposite the door (either opposite or diagonally) and it’s in your wealth direction, it will help you improve your financial status and invite more business and career opportunity to you. Another way to sleep wealthfully is to place a wealth bowl under the bed. If you have a wealth vase, money, a jewelry box or other kind of precious metals and stones, placing these under the bed will help you to be more in control of your wealth and draw more wealth to you. Tip No. 4. Observe bedroom feng shui taboos. Feng shui has other considerations in the bedroom besides placement of the bed. A key consideration is the design. Simple, attractive and non-flowery design is best and most restful. Flowers or plants in the bedroom design will drain a sexual relationship so that it comes to a stand still. It’s also important that you do not see or hear water while you’re in bed, such as from a toilet leaking or a pool fountain. Mirrors should also be avoided, especially if you can observe yourself in bed. By their nature, mirrors are activators and can be too stimulating for a bedroom to be truly restful. Tip No. 5. The TV debate. Many feng shui articles and experts say the TV should be banned from the bedroom. However, this was often because TVs had a rounded glass front that when turned off made them into a mirror and they often reflected the bed. It is the mirror effect that was the major cause of concern versus the television. Today’s flat screen TVs become black and flat when turned off and do not reflect the bed. So, go on and watch TV in bed…I do! Tip No. 6. Employ some bed magic. If you have trouble sleeping try placing a tortoise figure under the bed to give you more support. If your back aches at night add a few sticks of chalk into a bowl with rice and place under the bed to alleviate discomfort. Canopies over beds are excellent feng shui and uber romantic, so if you want to spice up your romantic life, try a canopy. They’re also great protectors if you have beams above your bed. If travel is something you’d like to do more of, add a conch shell under the bed.